This large Weather Pack kit is ideal for large projects that require multiple wire connections. 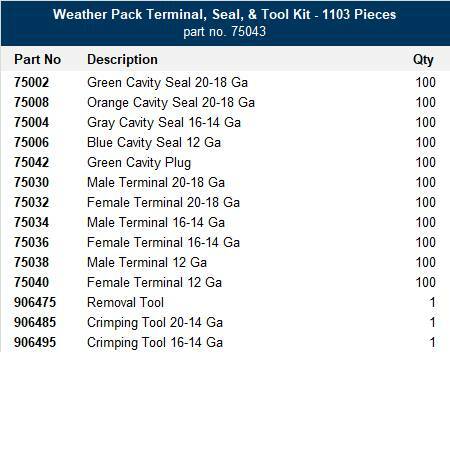 Weather Pack kit contains a large assortment of both male and female terminals, seals and plugs, as well as two Weather Pack tools. 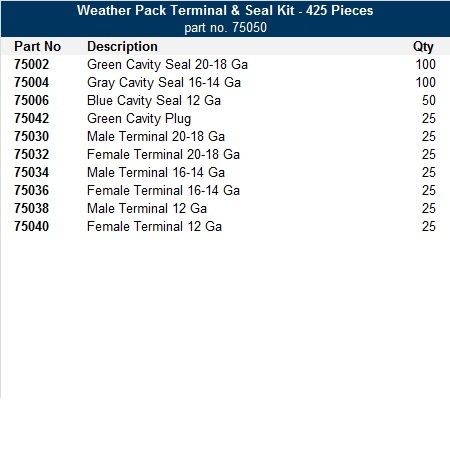 1,103 Piece assortment of both male and female terminals, seals and plugs. Also included are 2 ratchet style crimping tools and 1 terminal removal tool. All contained within a rugged, gray metal scoop box (18" x 12" x 3"). This Weather Pack starter kit provides all essential Weather Pack male and female terminals, seals and plugs. This small Weather Pack kit ensures you have inventory and is ideal for multiple small projects. An excellent starter kit for the Weather Pack system. Contains an assortment of male and female terminals, as well as seals and plugs. All contained within a durable, lightweight, translucent plastic carrying case (6-7/8" x 3-3/8" x 1-7/16" ).